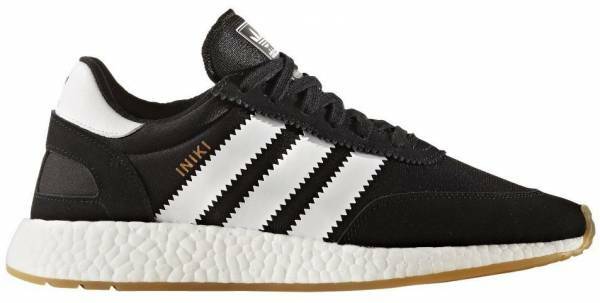 The Adidas Iniki Runner is a very comfortable shoe according to a majority of the reviewers. According to some of the reviewers, the shoe is really lightweight. A good number of reviewers said that the shoe provides a breathable feeling to the foot. Some buyers pointed out that the shoe has a good quality. A lot of the reviewers gushed about the versatility of the style of the shoe. A few of the buyers said that they liked the colorways of the shoe. Most reviewers really loved how they get a lot of compliments when wearing the Adidas Iniki Runner. Some reviewers were highly appreciative of the retro look of the shoe. A good number of reviewers said that they would definitely recommend the shoe. A multiple number of colorways are available to choose from in purchasing the shoe. The shoe can be purchased in a reasonable price. According to some reviewers, the Adidas Iniki Runner runs a bit wide. One reviewer pointed out that the shoe lacks arch support. Some of the reviewers complained about the OrthoLite Sockliner being too thin. A new silhouette from Adidas with its origins taken from the 1970s running shoe archive of the brand, the Adidas Iniki Runner is a combination of old school and modernity. The vintage look of the shoe gives off a retro vibe that gains quite some attention. The Boost midsole provides great responsiveness on the foot with each stride. The shoe gives off a rather comfortable, lightweight, and breathable feeling for the foot though it can fit a bit wide for some. The shoe, which is sold at an affordable price, makes it an even better deal. The Adidas Iniki Runner is a fresh silhouette from the Adidas brand but it took inspiration from the classic running shoes of the brand. Digging through their 1970s archive, the brand was able to give an image to the new silhouette. Combining both the vintage look and the modern technology they were able to create an advanced retro shoe. A bunch of colorways were released for the shoe including one called “Pride of the 70s” that was released in April 2017. The clean colorway features a combination of both white and off-white upper with the Three Stripes and part of the heel in blue. The look of the shoe was finished with a Core Red outsole. There were also some collaborative releases of the silhouette. One was the Neighborhood x Adidas Iniki Runner. The collaborative release between the Japanese streetwear brand and Adidas showcases a rather simple appeal. A breathable Primeknit base with some hints of suede in an all-black cover the shoe with an “NBHD” and “BRGD” which stands for “Neighborhood Brigade” printed in white at the heel. Adidas then teamed up with END and Bodega and released the END x BODEGA x Adidas Consortium Exchange. This collaborative release with the two retailers was the latest addition to the Adidas Consortium Exchange, a program created by the brand this year, 2017, that a number of the world’s most influential retailers are assigned to release a two-shoe pack in an outlined concept. The two retailers gathered inspiration in designing the two silhouettes included in the END x BODEGA x Adidas Consortium Exchange from Adidas’ past. The creamy soft suede upper version of the Adidas Haven is a representation of the past year’s running technology, while the denim covered Adidas Iniki Runner features a more modern look. Influence from the Boro Denim and the Japanese Sashiko stitching method was also taken in designing the silhouettes. Some more other fresh colorways of the Adidas Iniki Runner were released, giving the people far more choices that would suit their tastes. The Adidas Iniki Runner is a combination of both old and new. Though originally designed as a running shoe, its whole retro look proves its versatility. The shoe can be a perfect choice for street style finish when going out with friends or having a casual stroll around the city or town. It goes well with a pair of jeans, joggers, or jogger jeans. The shoe fairly goes with different kinds of casual outfit. A two-way stretch mesh and vintage suede upper cover the upper of the Adidas Iniki Runner which provide the foot an adjustable fit, fairly going with the form of the foot. A hidden sock construction was also added to the shoe for an easy slip-on and additional comfort. The shoe is offered in both men’s and women’s sizing with their corresponding colorways. Sizes ranging from size 4 to size 14.5 are offered in men’s sizing while sizes from size 3 to size 13 are offered in women’s sizing. Half sizes are also available. The retro look and the Boost sole of the Adidas Iniki Runner are both what capture the attention of most buyers. They praised the comfortable feeling they get because of the Boost sole of the shoe. Most are also gushing about the design and style of the shoe as according to them it gives off a retro vibe. The word “Iniki” in Hawaiian means piercing gales, sharp, or like a hurricane. The shoe features a shiny tongue. A webbed gum rubber outsole is observed which provides good traction. The traditional 3-stripes logo of the brand is printed on the sides in a serrated form. An “INIKI” branding can also be observed on the sides of the shoe. The Trefoil Adidas logo branding can be seen on the tongue and heel of the shoe.